Template driven validation is a type of form validation where validation rules are set directly in the form elements using directives. 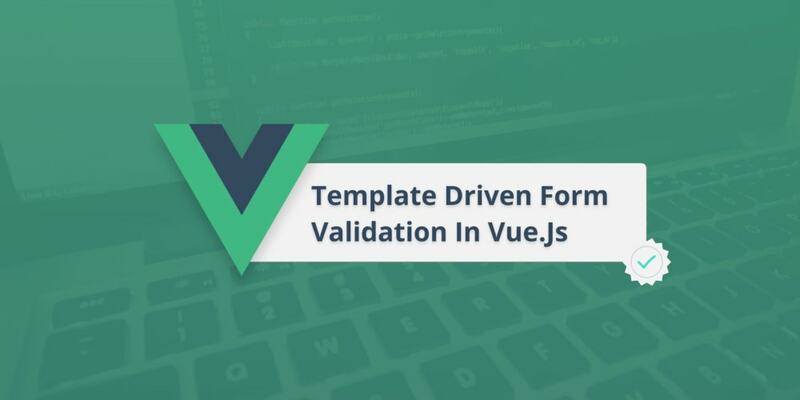 To implement template driven validations in Vue.js, we can use VeeValidate. VeeValidate is a plugin for Vue.js that allows you to validate input fields and display errors. At the end of this piece, we will build a simple registration form which uses VeeValidate to validate its form input. Here is a pictorial view of what we will build. First, we need to grab Vue and the VeeValidate library. Let us grab the browser build for Vue.js which is available here. Next, we will grab the browser build for VeeValidate which is available via jsdeliver here. The code above shows how easy it is to include VeeValidate into our Vue project. Vue.js is notified that it can use the VeeValidate plugin at the line that says Vue.use(VeeValidate). Now every time the input changes, the validator will run the list of validations from left to right, populating the errors helper object whenever an input fails validation. As at the time of writing this tutorial, VeeValidate ships with 30 rules for form validation with an option of creating your own rules. You can take a peep at what rules are available here. However, to use this method, some things must be put into consideration. The name attribute must be specified. It serves as an identifier for VeeValidate to refer to. You can use data-vv-name if, for some reason, you can’t use name attribute in your template. // will be added to default English messages. // Returns a Boolean or a Promise. The validate method in the object returns a boolean, an object or a promise. If it returns an object, the valid property must be present with a boolean value. This boolean value is what is checked to see if the form is valid or not. In our case, we checked if the value is included in the list of usernames we do not want people selecting from. Email: The email of the user registering. Note that the v-validate directive was also added to it, specifying required|email which means the input is required and must contain a valid email. Like the name input, this also has a span input attached in similar fashion. Username: The general username for the user registering. Note that we have something a bit different in the v-validate directive here. We passed in a rule called checkuser. Remember this custom validator that we made? Here we see it in action. Like the name and email input, this also has a span input attached in a similar fashion. Password: The password the user registering must set. In the v-validate directive of this input, we have another rule specified min:6. This tells VeeValidate that the password must not be lesser than 6 characters. Like the name, email and username input, this also has a span input attached in a similar fashion. Password_confirmation: Here we want the user to confirm his password. This is helpful, so he doesn&apos;t make a mistake in his password unknowingly. Notice that in the v-validate directive, we passed in confirmed:password as one of the rules? This tells VeeValidate that the value of this input must equal the value of the password input. Like the name, email and username input, this also has a span input attached in a similar fashion. Also, our markup consists of a button, which is used to submit the form. First, I want you to take a look at the Form declaration in the markup and notice the @submit.prevent="processForm". This prevents the form from refreshing or performing any other action when this button is clicked rather than the one defined in the processForm function in our Vue methods. Also, notice that in the button, we have a little condition for the disabled property of the button :disabled="errors.any()". The errors.any() is a method exposed by VeeValidate to verify if all validations were passed or not. Above is the code to link bootstrap to our registration page. To make it much nicer. The code block is pretty similar. First we see the custom rule we created earlier on, extended it to the default validator and mounted our Vue instance. Let&apos;s move to the methods section and see what we have in our proessForm method. Here we call the $validator.validateAll() function, which is a method exposed by VeeValidate which tries to validate all inputs and then returns a promise. We then check if the validation was succesful and triggered an alert. In this article, we have seen how to validate form inputs using the template driven approach. VeeValidate has made it very simple to validate form inputs by exposing a v-validate directive as well as giving room to extend / add custom Validators. When next you need to validate forms in Vue, and you want it template driven, you now know the way to go.